The power of storytelling can’t be underestimated. One of the things that gives me hope for the future — no joke — is that kids today can grow up, not just watching but actively debating the radically inclusive popular cartoon show Steven Universe. 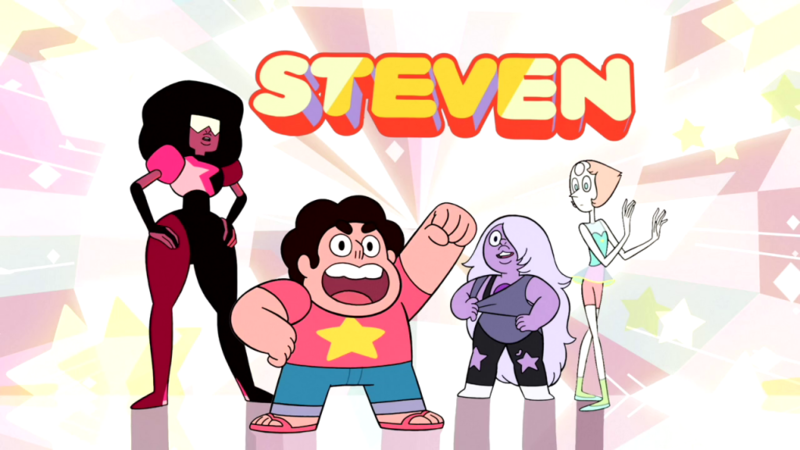 As WWAC has written, Steven Universe is Cartoon Network’s first original cartoon with a female showrunner (she’s also bi). The show is radically inclusive of gender expression, non-nuclear families (even the central family is clearly a queer family), immigrants (from both outer space and earthly environs), people with autism, gender nonconforming people — one of the characters is literally comprised of smaller lesbians. There are a diverse range of body types and racial characteristics and cultures. It deals with abusive relationships and the lasting effects of trauma. It addresses cultural appropriation and the problems with “allies” who center their needs over the people they claim to be in allyship with. It’s not the first kids show to have a boy protagonist who cries yet is still a hero and who’s empathy is key to his heroism. That is definitely a feature in Adventure Time With Finn and Jake, a show that the showrunner of SU worked on before — but in Steven Universe those are his superpowers. Literally. I’m pretty sure that kids who grow up watching it will be better for it and I know for a fact — because they talk about it on social media– that young teens who watch it are learning about gender diversity and thinking about gender identity and relationships in complex ways that people of my Generation X only started examining in Queer Theory classes in college. Young folks watching Steven Universe are learning how to identify abusive relationships because of this show and having richer conversations for it. That’s why on Wednesday I’m hosting a twitter chat about Steven Universe with featured guests Mia Birdsong, Charles Pulliam-Mohr and Veronica Arreola. Pulliam-Mohr writes for I09 and host the Steven Universe podcast, Boozy Breakfast Friends (which is a blast). Birdsong is co-director of Family Story–a nonprofit organization that challenges the narrative that only nuclear families are healthy families and that nuclear families should be everyone’s aspiration. Steven Universe is a celebration of all kinds of families and Birdsong is a new fan of the show. Arreola is a “professional feminist”, a mom and a massive Steven Universe geek. On Wednesday we will be having a conversation with fans and activists about why we watch the show and the lessons it can teach. Is engaging in this show’s fandom a place to build activism? Can we the show help us to have challenging personal conversations? The conversation starts on Weds at 9pm EST on Twitter at the hashtag #PopPoliticsChat. Just tweet with that tag and join in! As a professional organizer for a social justice nonprofit, one of the reasons I chose Steven Universe for this tweet chat is because it has one of the most passionate fandoms in social media. That passion for representation has at times lead a small number of young people to behave abusively to the point of bullying one of the show’s artists off of Twitter. But that looked more like a case of young people in need of an intervention and a lesson on how to interact with others on social media than anything intrinsically “bad” about the fandom. Every fandom can exhibit toxic behaviours– that’s a symptom of being a group of imperfect people in an imperfect world. At #PopPoliticsChat we don’t hide from the fact that even the media we love can be problematic. We also acknowledge the challenges of fan activism: when the media you love is owned by corporations our relationship must always be critical. But that’s all on the table on Wednesday. Our last chat was in April and we talked about Ms Marvel and Ms America Chavez with over 100 fans. So join us!